Stereotactic body radiation therapy (SBRT) is an effective treatment for many patients with inoperable liver cancer, but with a caveat: Liver function may be seriously damaged from radiation-related toxicities if treatment is not properly planned to minimize this risk. Because of this, SBRT may not be an option for patients with pre-existing liver dysfunction such as cirrhosis. Individualized adaptive treatment regimens and real-time motion compensation techniques to identify patients at risk are two initiatives in progress to improve the safety of this treatment. Ninety patients with 116 tumors (ranging from 0-13 cm, median 3 cm) participated in this clinical trial. The majority (77%) had hepatocellular carcinoma (HCC), 19% had metastatic cancer, and 4% had intrahepatic cholangiocarcinoma. Over two-thirds had cirrhosis. Patients ranged in age from 34 to 85 years. Before receiving SBRT treatment, 36 patients had undergone prior radiation therapy, 13 received prior radiofrequency ablation, and 70 had received prior transcatheter arterial chemoembolization. The research team used indocyanine green retention at 15 minutes (ICGR15) as the biomarker of liver function. The liver is the only organ that removes ICG, and therefore, the speed of clearance from the blood is directly associated with liver function. Changes in ICG levels are also consistent with individual liver sensitivity to radiation. Levels may change as early as one month following completion of radiation treatment. For this patient cohort, the median pretreatment ICGR15 was twice the upper limit of a normal liver (at 22%). Lead author Mary Feng, MD, and colleagues set a mid-treatment protocol threshold of 39%, which they ultimately increased to 44%. The SBRT treatment plan consisted of 5 fractions to a total of 60 Gy or a maximum predicted rate of radiation-induced liver disease of 15%. Three fractions were delivered and then the treatment was halted for a month and patients were retested for ICGR15. If the ICRG15 was unchanged, the remaining two treatments were delivered as planned. If a patient’s ICGR15 worsened, either the remaining dose was reduced, or SBRT treatment stopped entirely to maintain adequate liver function after treatment. Sixty-four (55% of the total) tumors had full treatment, while treatment was dose-reduced to maintain safety for 52 (45%) tumors. Radiation dose was lowered for the remaining 2 fractions for half of these tumors and stopped entirely for the other 26 tumors. The primary outcome of this clinical trial was local control, and these rates were 99% at one year and 95% at two years following treatment with a median follow-up of 37 months. Local control was not associated with overall survival, which was only 36% at two years for these patients with late-stage liver cancer. The authors reported that the patient cohort tolerated the treatment well, and that there was a lower than expected complication rate. A pilot single-arm study (NCT02460835) is underway at the University of Michigan Comprehensive Cancer Center with 35 patients ineligible for surgical resection to investigate the minimum radiation dose required for local tumor control. All patients have tumors > 4 cm and/or Child-Pugh status of B8 or higher. In this clinical trial, patients who have a complete response after 3 of 5 delivered fractions will not receive the additional SBRT treatment. The treatment is adapted based on each patient’s change in viable tumor as well as liver function to simultaneously intensify therapy for patients who have more refractory tumors and to maximize post therapy liver function. This trial is actively accruing patients and is scheduled for completion in May 2019. “We are hoping that this approach can extend the benefits of radiation therapy to a group of patients who have been at higher risk of complication in the past,” Dr. Lawrence told Applied Radiation Oncology. If the outcomes are promising, the Michigan researchers plan a phase II randomized study of standard vs spatially and dosimetrically adapted RT. 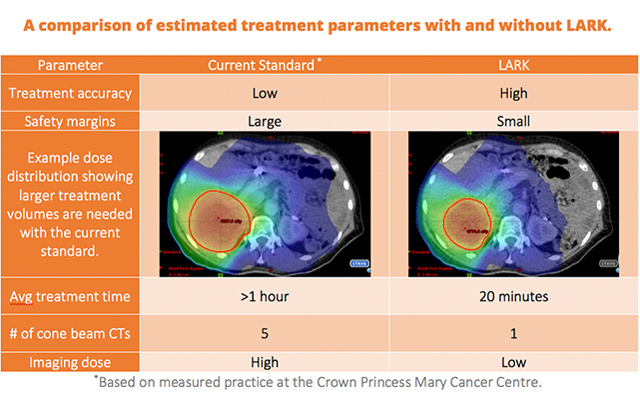 A new “world’s first” clinical trial testing the effectiveness of kilovoltage intrafraction monitoring (KIM) with SBRT to treat 46 liver cancer patients has just been launched in Sydney, Australia. KIM is a real-time intrafraction tumor tracking system that provides 6 degrees-of-freedom (DoF) motion information during SBRT. The KIM system uses the image-guidance system mounted on a standard linear accelerator to acquire 2-dimensional (2D) projections of implanted fiducial markers, and from this data, reconstruct 3-dimensional (3D) positions by maximum likelihood estimation of a 3D probability function, and further computations to obtain 6 DoF motion information. This capability enables real-time monitoring of a tumor's position and rotation prior to and during SBRT. For over a decade, research to develop the KIM system has been led by Paul Keall, PhD, a professor of medical physics at the University of Sydney Medical School and director of the university’s ACRF Image X Institute. The institute’s goals are to revolutionize medical imaging, to pioneer functionally targeted radiotherapy and to enable global access to cancer radiotherapy. KIM was first successfully used with prostate cancer patients starting in 2014.2 The system tracks prostate motion in 3D with submillimeter accuracy, providing tumor targeting and enabling tighter treatment margins. It helps improve the accuracy of the radiation beam, therefore reducing radiation dosage, treatment time, and toxicities for patients. The new Liver Ablative Radiotherapy with KIM (LARK) clinical trial (NCT02984566) will be sponsored by the ACRF Image X Institute. Participating organizations currently will include the Westmead Hospital and Royal North Shore Hospital in greater metropolitan Sydney, and the Aarhus University Hospital in Aarhus, Denmark. Professor Keall told Applied Radiation Oncology that he is excited about investigating the KIM technology to help tumor targeting for liver cancer SBRT patients. “Due to breathing, the liver is always moving. We look forward to the challenge of real-time tracking of liver tumors with KIM. The constant motion means that real-time tracking is important for liver cancer patients,” he said. Feng M, Suresh K, Schipper MJ, et al. individualized adaptive stereotactic body radiotherapy for liver tumors in patients at high risk for liver damage: a phase 2 clinical trial. JAMA Oncol. 2018;1(4):40-47. Kim JH, Nguyen DT, Booth JT, et al. The accuracy and precision of Kilovoltage Intrafraction Monitoring (KIM) six degree-of freedom prostate motion measurements during patient treatments. Radiother Oncol. 2018;126(2):236-243. Clinical trials increasing safety of SBRT liver cancer treatment . Appl Rad Oncol. Cynthia E. Keen is a medical writer and regular contributor to Applied Radiation Oncology. She is based in Sanibel Island, Florida.